Bundoora is a suburb of Melbourne, Victoria, Australia, 16 km north of Melbourne's Central Business District. 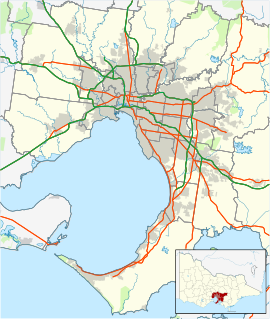 Its local government areas are the Cities of Banyule, Darebin and Whittlesea. At the 2016 Census, Bundoora had a population of 28,653. The word Bundoora is derived from "Kelbundoora", the name of a 19th-century Wurundjeri tribesman. The Bundoora area was originally inhabited by the Kurnaj-berring tribe of the Wurundjeri clan. Prior to European settlement, there were several large wetlands that were utilised by members of the Kurnaj-berring tribe. Europeans first arrived in the Bundoora area, known at the time as the Parish of Keelbundora, in 1835. The land for surveyed in 1837 by William Wedge-Drake to allow for the sale of land. The land has previously been owned by members of the Port Phillip Association such as John Batman, who grazed their sheep there without regard for the Wurundjeri clan. The land was subsequently auctioned in Melbourne in 1838 with Bundoora being sectioned off into two areas of approximately 400 hectares. The land was purchased by well-off individuals and land speculators who resold the land within a few months, this time in blocks of 40 to 120 hectares (100 to 300 acres). It was primarily used for sheep grazing and grain production. Bundoora Post Office opened on 1 October 1863. In 1899, John Matthew Vincent Smith, a well known horse breeder, purchased a 242-hectare (600-acre) property known as "Bundoora Park". The property was used to raise racing horses. A competition was held in the same year to design a homestead for the property. Sydney Herbert Wilson, who designed the Malvern Town Hall, claimed the prize of 50 pounds. The Bundoora Homestead remains a significant example of Queen Anne style Federation architecture. Bundoora is home to Mount Cooper. Mount Cooper is located within Bundoora Park, a large (180 ha) public park. Often claimed to be Metropolitan Melbourne’s highest point. Bundoora is situated on the traditional lands of the Wurundjeri people, and the name "Bundoora" is derived from "Kelbundoora", the name of a 19th-century Wurundjeri man. The most common ancestries in Bundoora were English 14.8%, Australian 14.2%, Chinese 12.4%, Italian 9.6% and Irish 5.5%. 54.3% of people were born in Australia. The next most common countries of birth were China 10.2%, India 3.4%, Italy 2.3%, Greece 2.0% and Sri Lanka 1.9%. 50.2% of people spoke only English at home. Other languages spoken at home included Mandarin 11.0%, Italian 4.1%, Greek 3.7%, Macedonian 3.3% and Arabic 3.1%. The most common responses for religion were Catholic 27.1%, No Religion 27.0% and Eastern Orthodox 9.3%. Big Daddys, a well-known pizza establishment, originated in Bundoora, and was the protagonist in the Melbourne $5 Pizza Wars of the early 2000s. It has now been bought-out by the Pizza franchise Domino's. Although, technically in Thomastown, the Bundoora All-Weather Market was until recently a major Melbourne market. This market has been demolished and replaced by a homemaker centre. Greensborough Lanes is a bowling alley that, despite its name, is located in Bundoora. University Hill is a business park home to the Australian Headquarters of Continental AG, NOVA iT GROUP and Bundoora BMW with many others and a Hotel to serve visitors to the area. Brand Junction, a DFO-style discount shopping mall, was opened at University Hill in November 2008. It is now known as Uni Hill Factory Outlets (UHFO). La Trobe University, established in 1964, is Victoria's third university with Bundoora being the location of its flagship campus. RMIT University's Bundoora West Campus is located at the terminus of the tramline. Further down the road is the East Campus area, home of RMIT's Wind Tunnel. It is also home of the RMIT University Sports Statistics Research Group. Bundoora Secondary College is a coeducational public secondary school. Parade College is a Catholic independent secondary school for boys . Loyola College is a Catholic independent secondary school in the Ignation tradition, bordering Bundoora and Watsonia. The Concord School, for students with additional learning needs. Bundoora Extended Care Centre, part of the Northern Health Network. A sub acute hospital providing medical care for over 100 inpatients and community outpatients. Bundoora is the terminus of tram route 86. The line was completed in 1986. The last W2 class tram ran along this route in mid-1987. The closest train stations are Watsonia on the Hurstbridge line and South Morang railway station on the Mernda line. The Western Ring Road Trail and Darebin Creek Trail provides facilities for recreational and commuting cyclists. Throughout Bundoora buses offer transport to the surrounding area. From the Latrobe University bus link on Plenty Road there is access to many suburbs throughout Melbourne, even connecting the north to the south. On a weekend the Nightrider has services running through Bundoora for late night travel. Bundoora has a football team competing in the Northern Football League. Golfers play at the Bundoora Park Public Course on Plenty Road, at the course of the Strathallan Golf Club on Main Drive or at the course of the Kings Park Golf Club on Plenty Road. Bundoora is also home to the Bundoora Brumbies Baseball Club, the club competes in the Melbourne Winter Baseball League in B and D grade division with reserves teams in both B reserve and D reserve. The club also has a Women's team that competes in the Baseball Victoria Summer League Women's section. The City Football Academy, administrative and training headquarters of A-League club Melbourne City FC is located in Bundoora, adjacent to the La Trobe University main campus. Nearby libraries include Watsonia Library, Diamond Valley Library and Mill Park Library which are operated Yarra Plenty Regional Library. City of Preston - A former Local Government Area which Bundoora was a part of. Shire of Diamond Valley - A former Local Government Area which Bundoora was a part of. ^ a b Australian Bureau of Statistics (27 June 2017). "Bundoora (State Suburb)". 2016 Census QuickStats. Retrieved 3 July 2017. ^ a b La Trobe University, 'History of the area', La Trobe Wildlife Sanctuary [website], <http://www.latrobe.edu.au/wildlife/about/history>, accessed 29 Oct. 2015. ^ Darebin Heritage, 'Bundoora Homestead', Darebin Heritage [website], <http://heritage.darebinlibraries.vic.gov.au/article/282> Archived 29 February 2016 at the Wayback Machine, accessed 29 Oct. 2015.